Dollar store craft finds never looked as sweet as they do in these hanging glass containers that are a perfect candle or plant holders. If your local dollar store doesn't carry the materials for this project, you can also find the necessary supplies at your local hardware store. Don't worry if you can't find the exact same shape or size glass bowl since this design is flexible enough to work with most similarly sized containers. You can substitute copper wire for the aluminum wire used in this project, although it may be a little harder to coax into shape. 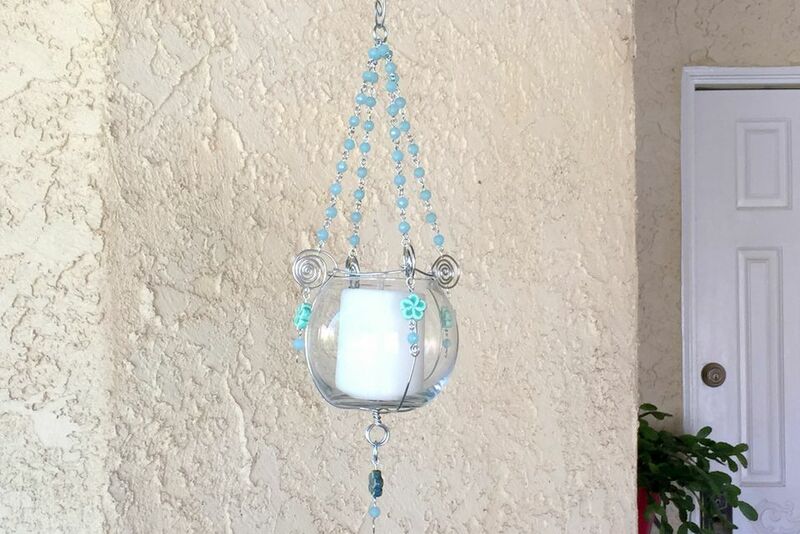 This project is worked in two parts: first, you make a wire frame to hold the glass container, and then you make a chain to hang the container from and add decorative embellishments. Cut two pieces of aluminum wire about 30 inches long. Using a sharpie or similar sized round item, wrap the two wires around the sharpie barrel so they meet at the top, and twist them together at least three or four turns to secure the wires around each other. Remove the marker and you're left with a loop and two groups of double wire. Separate and arrange the wires into an 'X' shape so they are evenly spaced as shown in the picture. These wires will form the main frame that holds the glass container. Shape the wire around your glass container. Keep the loop centered on the bottom of your glass container while you move the wire around the glass. Remove the wire frame from the glass container. Using round nose pliers, make a small loop at the end of the wire. Use your fingers or the pliers to wrap the wire around the small loop to make a spiral. Repeat this process on each wire end. You will adjust the spiral size and wireframe to fit the glass container in the next step. Fit the glass bowl inside the wires. Continue to spiral the wire until they are just above the lip of the glass container. Slip the elastic band over the base of the wire and container and roll it up the sides so it holds the four wires in place around the glass container. Adjust the wires so they are equally spaced. Keep the loop centered at the base of the bowl. Cut a length of 16 or 18 gauge aluminum wire at least 12 inches long. Wrap the wire around a frame wire just beneath the spiral, above the lip of the container. Continue to shape and wrap around the frame wires until you return to the first wire. Wrap around the first wire a second time and trim the ends. Even if you are using a slightly different shaped glass container, the wireframe should resemble the picture and your glass container will be held in place. We used the 1-step looper pliers because they make bead chains like this quickly and easily. The one tool bends the loop and cuts the wire to the right size. It will take more time to make wire chain using simple loops, but it is good practice for any jewelry maker. You can also buy chain or use wire if you want to make this more quickly. Following the instructions for the 1 step looper, make individual bead components. Join the bead components by opening the loop to the side. This is the same way that you open jump rings to avoid them bending out of shape. Each bead chain should be the same size–at least 6 inches long. Attach each bead chain to the wire frame in the outer loop of the wire spiral using a jump ring. Use a large jump ring to join the bead chains together. The large jump ring will provide a way to hang the candle holder. You can add more decorations to your glass candle holder if you'd like. When you are satisfied with your design, add a candle or plant to the glass container. It can be hung outside or inside.